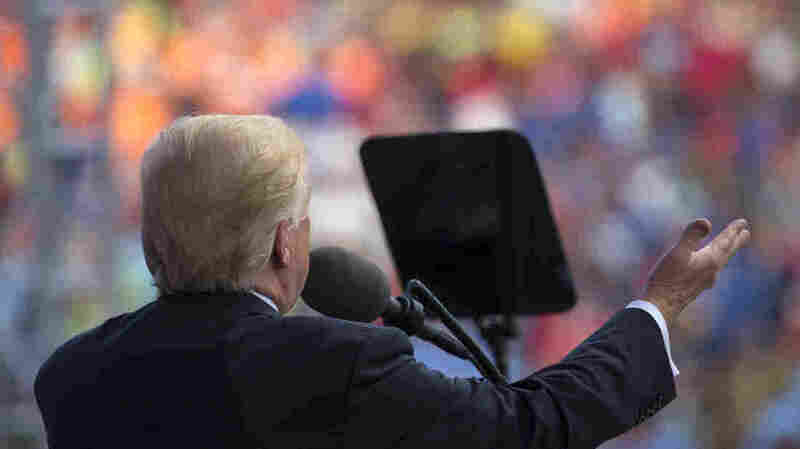 Trump's Boy Scouts Speech And The Thin Line Between Openness And Recklessness The president seemed to be in campaign mode in a stop in West Virginia on Monday, mixing politics, insults and saltiness. The problem is he was doing it in front of adolescent boys in the Boy Scouts. President Trump speaks at the 2017 National Scout Jamboree in Glen Jean, W.Va., on Monday. "Know your audience" is usually the first rule of public speaking. But that doesn't really seem to matter all that much to President Trump. Trump became overtly political in yet another setting that some are seeing as crossing the line — in a speech to the Boy Scouts. "Tonight, we put aside all of the policy fights in Washington, D.C., you've been hearing about with the fake news and all of that," Trump said at the Boy Scouts National Jamboree in West Virginia. "We're going to put that aside. And instead we're going to talk about success, about how all of you amazing young Scouts can achieve your dreams, what to think of, what I've been thinking about. You want to achieve your dreams, I said, who the hell wants to speak about politics when I'm in front of the Boy Scouts? Right?" "You know, I go to Washington," Trump said, "and I see all these politicians, and I see the swamp, and it's not a good place. In fact, today, I said we ought to change it from the word 'swamp' to the word 'cesspool' or perhaps to the word 'sewer.' "
Price's name triggered something for Trump. "Dr. Price still lives the Scout oath, helping to keep millions of Americans strong and healthy as our secretary of Health and Human Services," Trump began. And then: "And he's doing a great job. And hopefully he's going to get the votes [Tuesday] to start our path toward killing this horrible thing known as Obamacare that's really hurting us." Trump's injection of Price getting health care votes was odd not just because Trump pledged not to talk politics, but also because Price is a member of Trump's Cabinet with no control over Senate votes. He wasn't even a senator; he was a member of the House, so while he has contacts in Congress, his strongest relationships are on the other side of the Capitol. Trump wasn't done with Price. "By the way, are you going to get the votes?" Trump asked, looking at Price. "He better get them. He better get them. Oh, he better. Otherwise I'll say, 'Tom, you're fired.' I'll get somebody." Trump looked like he was joking. Right, Secretary Price? Right. Ha-ha. Hee-hee. Hoo-hoo. "He better get Sen. [Shelley Moore] Capito to vote for it," Trump noted of the senator from West Virginia, who has been undecided even about the motion to proceed to debate on health care. "He better get the other senators to vote for it. It's time. You know, after seven years of saying 'repeal and replace Obamacare,' we have a chance to now do it. They better do it. Hopefully they'll do it." Trump has been on fire of late when it comes to rattling the people who work for him. After shaking up his White House on Friday — bringing in a new communications director in New York hedge-fund manager Anthony Scaramucci, followed by the prompt resignation of press secretary Sean Spicer — Trump has been publicly shaming his attorney general, Jeff Sessions. Trump called Sessions "beleaguered" on Monday and then whacked him again on Twitter on Tuesday, criticizing him for not going after 2016 Democratic presidential candidate, Hillary Clinton, and for leaks in the intelligence community. Ignore the fact that once Trump won the presidency, he said he didn't think it was a good idea to try to prosecute Clinton. Suffice it to say, Sessions, an Eagle Scout member of Trump's Cabinet, was not on hand. The crowd's chanting seemed to egg him on. He took a familiar campaign shot at the media. "By the way, what do you think the chances are that this incredible massive crowd, record-setting, is going to be shown on television tonight?" Trump said. "One percent or zero? The fake media will say, 'President Trump spoke' — you know what is – 'President Trump spoke before a small crowd of Boy Scouts today.' That's some — that is some crowd. Fake media. Fake news." The Boy Scouts pointed out that the organization is "nonpartisan" and that this was a "long-standing tradition" to invite presidents to their jamboree. Trump is the eighth to attend. "By the way, just a question, did President Obama ever come to a Jamboree?" Trump said looking around with his arms stretched out wide. "And we'll be back. We'll be back. The answer is no. But we'll be back." It's true that Obama never attended in person, but he did record a video message in 2010. And while Trump wants to show his affinity with the Scouts, he wasn't one. Obama, on the other hand, was. Trump's use of "hell" was not the only utterance that could be seen as inappropriate by parents of the assembled Scouts. The president of the United States, in front of adolescent boys, went on to allude to a sordid story of the way a rich friend, William Levitt of Levittown fame (or infamy), lived his life after making his money. "Sold his company for a tremendous amount of money," Trump said. "And he went out and bought a big yacht, and he had a very interesting life. I won't go any more than that, because you're Boy Scouts, so I'm not going to tell you what he did. Should I tell you? Should I tell you? You're Boy Scouts, but you know life. You know life." Trump seemed to realize that as much as he wanted to tell the story, his "locker room talk" might not be appropriate. For as much as he wanted to mock the media and say the cameras weren't turned on, he knew they were. He knew every word he said was being recorded and on camera with thousands of witnesses. Some of the boys howled, as boys do, but some of their parents didn't seem too pleased, based on the comments on the Boy Scouts of America's Facebook page. Trump then meandered back to try for an inspirational moment: "So as much as you can do something that you love, work hard and never ever give up, and you're going to be tremendously successful, tremendously successful." "And you know, we have a tremendous disadvantage in the Electoral College. Popular vote is much easier. We have — because New York, California, Illinois, you have to practically run the East Coast. And we did. We won Florida. We won South Carolina. We won North Carolina. We won Pennsylvania. We won and won. So when they said, there is no way to victory; there is no way to 270. You know I went to Maine four times because it's one vote, and we won. We won. One vote. I went there because I kept hearing we're at 269. But then Wisconsin came in. Many, many years. Michigan came in. So — and we worked hard there. "You know, my opponent didn't work hard there, because she was told ... she was told she was going to win Michigan, and I said, well, wait a minute. The car industry is moving to Mexico. Why is she going to move — she's there. Why are they allowing it to move? And by the way, do you see those car industry — do you see what's happening? They're coming back to Michigan. They're coming back to Ohio. They're starting to peel back in. "And we go to Wisconsin, now, Wisconsin hadn't been won in many, many years by a Republican. But we go to Wisconsin, and we had tremendous crowds. And I'd leave these massive crowds, I'd say, why are we going to lose this state? The polls, that's also fake news. They're fake polls. But the polls are saying — but we won Wisconsin." There was even more — he went on about the latest jobs report, how people will be saying "Merry Christmas" again and the "billions and billions and billions" more money he's going to be pouring into the military. This wasn't the first time he has talked about politics in a setting where that could be seen as inappropriate. Remember that speech in front of the CIA memorial wall in which he asserted that most of the people in the room probably voted for him? It won't be the last time, either. This president couldn't care less about political and societal norms. But let's be very clear — none of this is normal. Trump has been publicly shaming his attorney general, mocking special counsel and congressional investigations, and confirming the existence of what was previously a covert CIA program — and that was all just Tuesday, and he did it on Twitter. Trump has no filter. It's giving Americans a window into his mind, but there is a thin line between openness and recklessness.